Earlier this week, a good friend of mine who also happens to be an author and blogger asked if I had an email template for saying “no.” Apparently, as a result of her rising visibility, she is getting numerous requests from people who want to meet with her or “pick her brain” about this or that. I get lots of requests like this, too. In fact, I have identified eleven different kinds of requests. I hate saying “no” to people. In fact, I don’t know anyone who enjoys it. 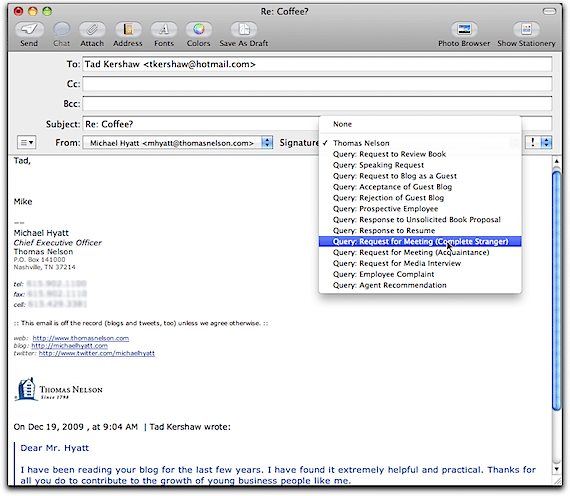 So to make the process less painful, I have developed a series of email templates that I can use for these requests. I use Apple Mail. I have entered each of these templates as an “email signature.” (Who says a signature has to be just a signature? It can be any kind of boilerplate text.) You can do the same thing in Microsoft Entourage or Outlook. You could also do this with a macro program like Typinator, Quickeys, Keyboard Maestro, or iKey. The tool is inconsequential. As CEO, I do not get directly involved in the hiring process except in very rare instances such as filling a key opening on our Executive Leadership Team or on my own staff. This page contains a list of all job openings currently available at Thomas Nelson. Click on the job that interests you and then read the full job description. If you are still interested in the job, click on the link that says, “Apply for Position.” This will take you to an online Job Application. Once you have submitted the form, someone in our Human Resources Department will review your application and take the appropriate action. If you can’t find a position that interests you, you might want to check back in a week or so, as these job postings are updated regularly. May God bless you on your job search, whether He leads you here or elsewhere. Again, thank you for honoring us with your interest in joining our company. Thanks for your interest in Thomas Nelson. Unfortunately, we don’t consider unsolicited queries, proposals, or manuscripts. I personally get hundreds a year; our staff get thousands. We simply don’t have the resources to review these. Thanks for your kind words about my blog. Thanks also for your interest in meeting with me. Unfortunately, that will not be possible for the foreseeable future. In order to honor my existing commitments, I must decline many worthy invitations like yours. However, this is one of the main reasons I blog. It allows me to connect in some way with people I would not otherwise have the opportunity to meet. My Blog. I have numerous articles on [topic] available on my site. You can find them all by using the Search feature in the right-hand sidebar of my blog. Consulting. I do a limited amount of consulting on this [topic]. My minimum is a one-hour consultation (not including travel time). Though I am expensive, I do provide a discount on half-day and full-day rates. I would be happy to explain how that works if you are interested. Speaking. I also speak on this topic. I have a one-hour speech called “[Title of Speech]” I also have done half-day and full-day seminars. If you are interested in this option, you might want to start by checking out my Speaking page. Thanks again for your interest. Let me know if I can provide anything further. Note: I don’t provide my consulting rates in this first email. I want to make sure they are interested first. Thanks so much for your interest in having me speak at your event. Brian Scheer handles all my speaking requests. I am copying him on my reply. He will be in touch with you shortly. Thanks also for your interest in having me take a look at your blog and offering my thoughts about it. Unfortunately, that will not be possible for the foreseeable future. In order to honor my existing commitments, I must decline many worthy invitations like yours. Media outlets requesting an interview. Fortunately, I have a communications director who handles my media requests. This could just as easily be my assistant. Thanks for your email. I appreciate your interest in interviewing me. I am copying Lindsey Nobles, my Director of Corporate Communications, in this reply. She handles all media requests for me and will be back in touch with you shortly. Thank you for your kind words regarding my blog. Thanks also for your interest in having me consider your book for possible review. As you might imagine, I get quite a few requests like this. In addition, my own company, Thomas Nelson, publishes about 350 new books per year. Unfortunately, I can only read 6–8 new books a month. I give first priority to the books I publish and then to the books that relate to one of my personal interests. Your book certainly sounds interesting, but I am afraid I will have to pass at this time. Vendors wanting an appointment to pitch their product. I get all kinds of emails from vendors fishing for leads. Most of the time, they haven’t taken the time to learn anything about my business or my specific needs; they are just trolling. My spam filter catches most of these. I delete the rest without responding. The act of sending me an email doesn’t obligate me to respond. The only exception I make is if someone I know referred the person or I have actually met them. Feel free to borrow my templates or adapt them to your circumstances. I have found that it is usually easier to start with something and modify it rather than create it from scratch. Question: What am I missing? How do you handle some of these same requests? You can leave a comment by clicking here.